(1) Beam elements are mainly used for analysis of nominal stresses in frames and similar structures. A conventional beam element for analysis of three dimensional frames has 6 degrees of freedom at each end node: three displacements and three rotations. This element can describe the torsional behaviour correctly only in cases in which the cross section is not prone to warp, or warping can occur freely. Analysis of warping stresses is impossible, when open thin-walled structures are analysed. (2) Usually, the beam elements are rigidly connected to each other at the nodal points. Alternatively, pinned joints can also be specified. However, in many structures the joints are semi-rigid. In addition, in tubular joints the stiffness is unevenly distributed, which causes extra bending moments. Such structural features require more sophisticated modelling than the use of rigid or pinned joints. (1) Membrane elements are intended for modelling plated structures which are loaded in-plane. They cannot deal with shell bending stresses. Triangular and rectangular plate elements are suitable for solving nominal membrane stress fields in large stiffened plate structures. (1) Finite element programs contain various types of thin shell elements. These include flat elements, single curvature elements and double curvature elements. The deformation fields are usually formulated as linear (4-noded element) or parabolic (8-noded element). In general, thin shell elements are suitable for solving the elastic structural stresses according to the theory of shells. 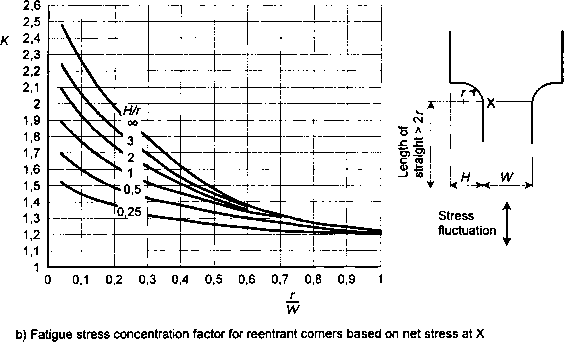 The mid-plane stress is equal to the membrane stress, and the top and bottom surface stresses are superimposed membrane and shell bending stresses. (2) Thin shell elements can only model the mid-planes of the plates. The actual material thickness is given as a property only for the element. There are also thin shells with tapered thickness, which are useful for modelling cast structures, for example. The most important drawback with thin shell elements is that they cannot model the real stiffness and stress distribution inside, and in the vicinity of, the weld zone of intersecting shells. (1) Some finite element packages also include so-called thick shell elements. These allow transverse shear deformation of the shell in the thickness direction to be taking into account. Thick shell elements work better than thin shell elements in e.g. details in which the distance between adjacent shell intersections is small, giving rise to significant shear stresses. (1) Sometimes it is useful to study the local stress fields around notches with a local 2-D model. A cross section of unit thickness can then be modelled as a two dimensional structure using plane strain elements. Why to take beam element in composite materials for fatigue analysis?